I don't think it's a secret that I'm a fan of the redeveloment of the Groveway area, which is why I'm so excited to see one of the first major projects since the passing of the Groveway Hybrid Form-Based Code get underway. The lot is currently being cleared and building may start in January with occupancy as early as next summer. Forrest Commons is a relatively small project on 3.3 acres mid-block between Forrest and Myrtle Streets just north of Hill Street. That said, it shows the potential that the new Groveway code brings to the area by helping to create a more walkable livable place. One of my favorite aspects is the sidewalk through the center of the block that will make that area significantly more walkable. Additionally, there is a community garden plot centered on the property and if the garden doesn't have something, the homes are just a short walk from the Riverside Farmers Market at City Hall. The Google Maps image below will give you an idea of roughly where this project will be. The site plan shows 22 residences, of which, nine will be single family detached in a townhome style and 13 will be attached townhomes. The homes are oriented to a center greenspace that will have the aforementioned community garden as well as a small center green that makes for a nice pocket park. The townhomes will be on the south and the single family will be on the north. They will have english courtyards and front porches respectively. Car access will be via alleys in the rear and thus, the front of the homes will face each other rather than a road. The experience of siting on your front patio and looking at a park, a garden and the front of another home is a significantly better experience than looking at a road, no matter how busy the road. As you wll see, the design and architecture is of a high quality and the vision is being executed by Monte Hewett Homes which has built some excellent homes in the area. The tandem of Lew Oliver Inc | Whole Town Solutions and Monte Hewett Homes is the same team that is building the homes in Avalon the Alpharetta development just up the road from Roswell. I did a post last year on those homes. I was able to get a preview of the Forrest Commons home designs for New Urban Roswell readers. 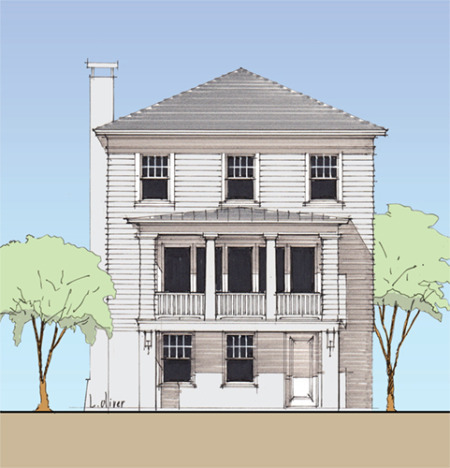 Below are three drawings of the detached homes as well as two of the townhomes. As you will see, this project will be a fantastic first step for the redevelopment that is starting in he heart of Roswell.